To mark World Poetry Day, City have launched the MakeWrite app. Co-designed by and for people with language problems after stroke, the app supports users in producing creative writing to share via social media. City, University of London researchers and people with aphasia have created the MakeWrite app to support users in producing creative writing, including poetry, which can be shared via their social media channels such as WhatsApp and Twitter. Launched to mark World Poetry Day the app is currently available for free download at the Apple Store. MakeWrite was co-designed by and for people with aphasia - a language disorder resulting from damage to portions of the brain responsible for speech and language, most often following a stroke. The app was developed by the City researchers behind EVA Park, a multi-user online virtual world that gives people with aphasia unique opportunities to practise their speech and establish social connections. Although the term aphasia covers a range of language problems experienced after a stroke, a common challenge is being unable to find the words the person would like to use to communicate. 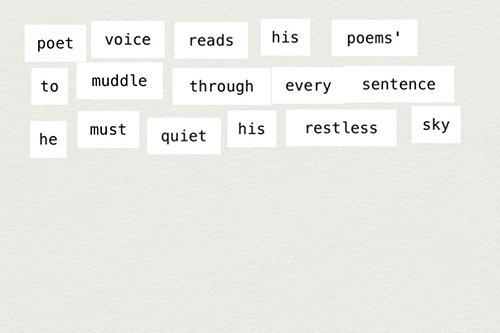 Drawing on the themes of constrained creativity and ‘Blackout Poetry’, MakeWrite enables users to choose a piece of text, redact or erase some of the text, arrange the remaining words, and then share the text with friends or via social media. MakeWrite can be used by anyone with a love for words and language. MakeWrite forms part of the Inclusive Digital Content for People with Aphasia (INCA) project, led by City’s Professor of Human-Computer Interaction, Stephanie Wilson and involving a team of researchers from City’s School of Mathematics, Computer Science & Engineering and the School of Health Sciences, and people with aphasia. The INCA project is undertaken in association with the Stroke Association and Dyscover and funded by the EPSRC. Given the dearth of online resources and creativity apps available to people with challenges such as aphasia, MakeWrite opens up possibilities for greater digital inclusion and access. Many people with aphasia experience social isolation, reduced wellbeing and poor quality of life. We believe the MakeWrite app will help people with aphasia overcome the challenges they face in creating digital content. I’ve really enjoyed making this app and I feel that it’s really helped me a lot in terms of my aphasia. I feel that the app we have produced is an important tool for speech therapists. The app enables the patient to put the words into verse to widen their vocabulary as they recover from a stroke or brain damage.